Net benefit $/hectare favours killing as many seeds as possible even at low capture rates. We have been modelling the cost benefit and have found with over 50% capture of weed seeds in the front of the header, you are better off getting as many weed seeds as you can with the Seed Terminator. Our engineering team are targeting maximum kill to maximise benefit. Interestingly, 30% capture or less and lower kill models make more sense. 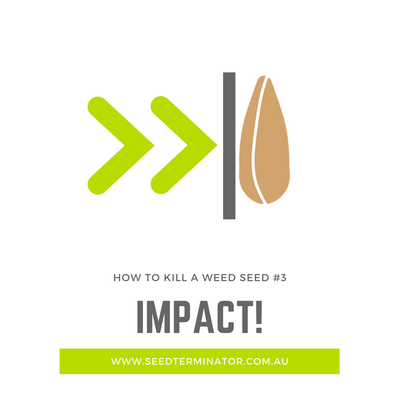 ​We have also developed a new mill technology that offers an alternative value proposition; market competitive kill results, lower power, wear and cost + plugs into the Seed Terminator. It was trialled on 4 machines for a full harvest in 2018 and will be available to for the 2019 harvest. Moisture content changes seed resistance to impact. 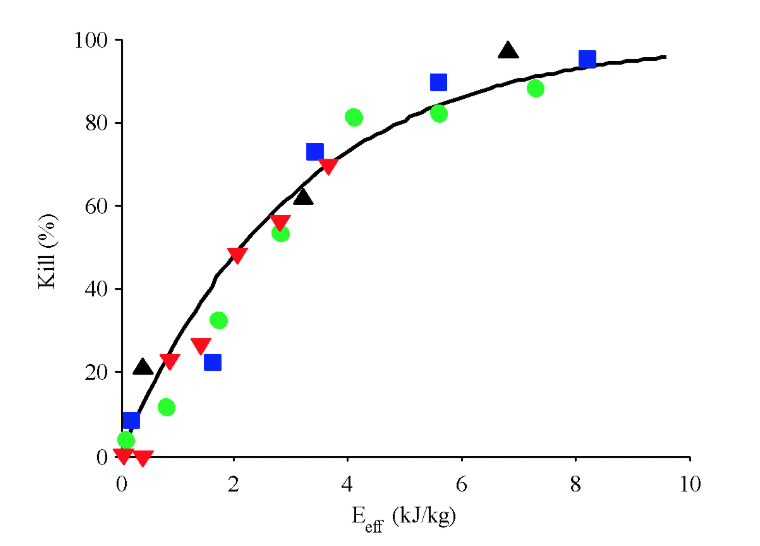 The graph below shows the effect of weed seed moisture content when relying on impact alone for Reduced Seedling Emergence (RSE% or kill), for example the red line shows 4 impacts at 70 meters per second; at 10% moisture content it has high RSE or kill, but at 13% moisture it drops to 90% and at 17% moisture the kill is 70%. What does this mean? In high moisture content scenarios impact alone has significantly reduced efficacy. The second point here is that if there was a drop in mill speed, relying on impact alone, the green line shows 4 impacts at 50 meters per second at 10% moisture the kill is just over 60%. What does that mean for Seed Terminator? 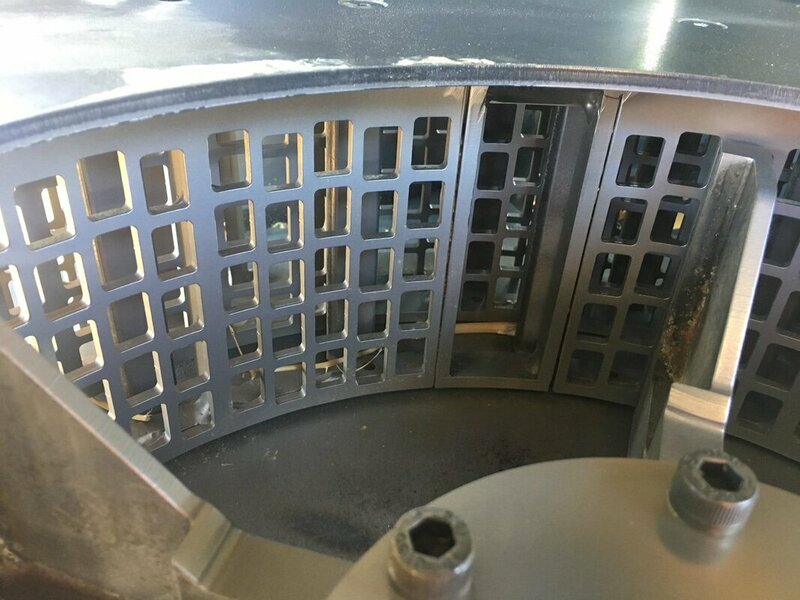 The Multistage Hammer Mill Technology has three stages of screens to classify material for size, the chaff material and weed seeds must be smashed small enough to fit through each stage of screens. Multiple stages enable high capacity while maintaining pulverisation to consistent level at a range of rotational speeds. The Seed Terminator Multistage Hammer Mill technology uses impact + shear + crush + grind to kill weed seeds ensuring consistent kill at a range of speeds 2250-3000RPM. How long does it take to change out the multistage hammer mills? It takes approximately 10 minutes to changeover a full set of mills. Will i be able to use the latest mill technology in my seed terminator? Yes, the Seed Terminator tech platform will be able to slot in the latest mill technology. We want this to be a future proof solution. Power and wear is the enemy, or is it? If you are not using power or wearing material you are not killing weed seeds. How many seeds do you want to kill? The Energy to Kill weed seeds (ryegrass) from Nicks thesis, the energy to kill ryegrass seeds, damaging (vs reduced seedling emergence or kill) follows this curve. its not a step curve, as not all the seeds are the same. Below minimum energy there is no seed kill or damage. As you can see from the images here, there is a turbulent wake behind the truck, creating hot air which is wasted energy. These aerodynamics (along with rolling friction) is largely why a truck uses more fuel/km than a sports car. At Seed Terminator we spend a lot of energy manufacturing the profiles of our components and making them aerodynamic. At 300km an hour the reduction in turbulence is compounded, allowing us to minimise the no load power. With 81 machines in the paddock we've learned a huge amount about wear. With this knowledge under our belt we are adjusting our thinking on wear; "if you are not using power and not wearing out steel you aren't actually killing weed seeds." 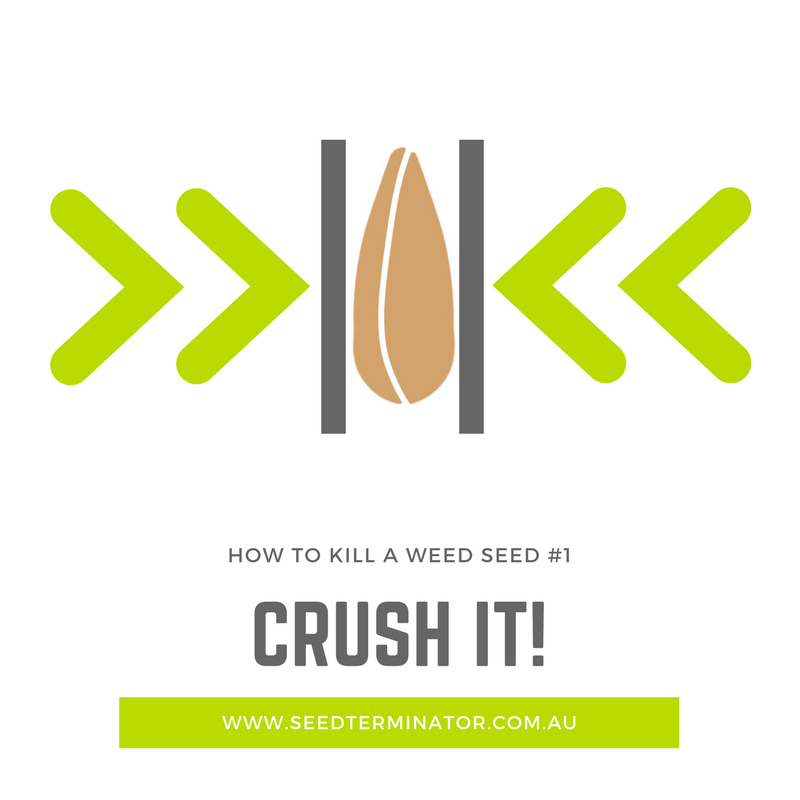 This means we should minimise wasted wear by minimising soil into the mills but maximise weed seed capture and weed seed kill, because cutting lower to capture more weeds is akin to applying a high dose of chemical; it costs more, but it's more effective. Mill wear is not repairs and maintenance, its closer to a drum of chemical. Soil type is a huge factor in wear. Mostly the soil that causes the wear, if you aren't getting soil in the front it doesn't matter what the soil type is, unfortunately its inevitable you will particularly when harvesting low to the ground. This ends up the mill. Front bouncing due to high speed and tyres lifting sand up and throwing it . into the front or the harvester cleaning fan. Low cut heigh with a rigid front can get a lot of sand. We've found flex fronts can be much better can double or triple the life of a mill in equivalent crops in equivalent soil types. Legumes can be worse. Canola almost protects wear parts. 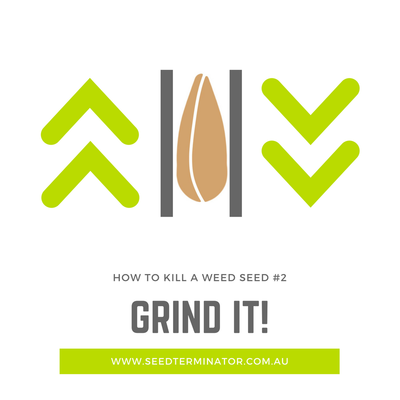 If the target is to kill as many weed seeds as possible, you need to cut as low as possible to ensure maximum capture of those potentially HWSC or herbicide resistant weed seeds. "We are working on a stochastic model for wear to further improve on farm value and our understanding of the technology. Our model shows a replacement parts cost of $2.38/ha based on our 2018 design, we are looking forward to reducing that for MY19. Watch this space." ​Uptime is a big focus for us, the most important thing we can do is not interrupt the harvest operation. ​This means minimising mill changeover time, ease of maintenance and developing systems to improve the speed of checking grain losses. 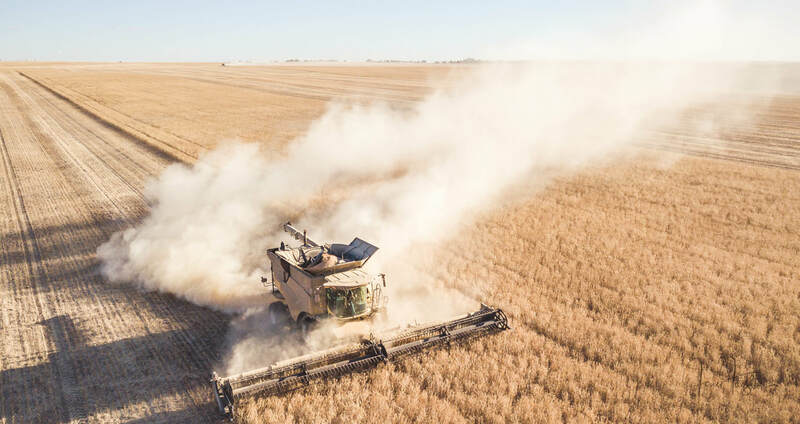 With 81 headers in the paddock over 2018 harvest and a combined total of 121 harvests, the Seed Terminator Mechanical Drive is paddock proven. Cleaning Shoe Performance is Unaffected. ​= confidence in your harvester setup to minimise grain loss. 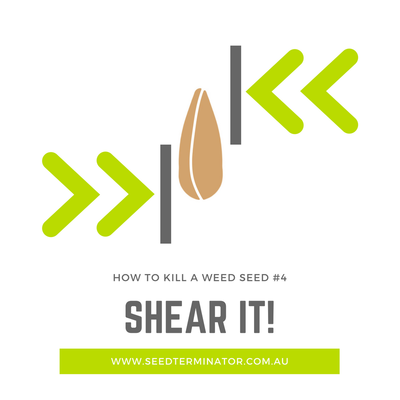 Fate of seed depends on seed shed, cut height, threshing parameters, and aerodynamic properties of seed.